In my medieval manuscripts course, we frequently work intently with Books of Hours -- digital facsimiles from other libraries as well as specimens available at the UGA Special Collections Library. The resources below are to help both the neophyte and the experienced student engage with these complex books. This page will be in constant evolution as the manuscript/Books of Hours courses shift; suggestions welcome. Books of Hours are typically in Latin and include, for the most part, standard offices and prayers. These are unfamiliar to the modern person but can be often be easily found online. An open Google search for 8-12 words of Latin will often pull up the right office/prayer/hymn, but one may also want to consult some controlled resources. I have developed a list of liturgical tags commonly found in Books of Hours, with short definitions. The Hypertext Book of Hours (http://medievalist.net/hourstxt/) is an online edition and translation of a 1599 English Book of Hours, with useful introductory material. The Thesaurus Precum Latinarum (Treasury of Latin Prayers) (http://www.preces-latinae.org/index.htm) prints the Latin texts of many common medieval prayers, with deliberately archaic translations. If you are trying to identify a non-Hour prayer, check this resource. Most of the texts you will encounter in Books of Hours come from the biblical book of Psalms (sometimes whole psalms, sometimes not). The Latin Vulgate Bible online (http://www.latinvulgate.com/lv/verse.aspx?t=0&b=21) will give you the Latin with facing English (King James) translations. 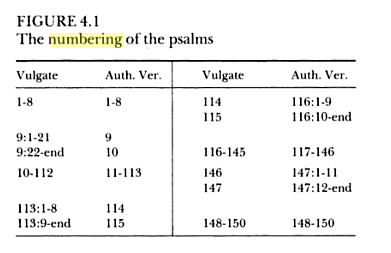 Remember, however, that the medieval psalm numbering is not the same as modern numbering; this table (taken from Andrew Hughes, Medieval Manuscripts for Mass and Office: A Guide to their Organization and Terminology, University of Toronto Press, 1995, p. 51 Fig. 4.1) will help you correlate modern and medieval numberings. You may also wish to use the Blue Letter Bible (https://www.blueletterbible.org/). Many older prayers were printed and/or translated in 19th century publications that are available freely online; you can check The Roman Missal Translated Into English (1843) on Google Books, Monumenta ritualia ecclesiae Anglicanae; or, Occasional offices of the church of England according to the ancient use of Salisbury (1846) on Internet Archive, or Breviary Offices, from Lauds to Compline Inclusive, translated from the Sarum book (1874), also on Internet Archive. Similarly helpful may be The Sarum Missal in English (1913), vol. 1 and vol. 2 also on Internet Archive. The 1914 edition of the Catholic Encyclopedia is available free online; it is an excellent quick reference tool for medieval religion, including saints and the different parts of the religious day or religious books. Note, however, that this is a pre-Vatican II publication, so it no longer accurately reflects the tenants of today's Catholic Church; it's still great, though, for historical religion. Prayers from the Middle Ages, available on CCEL, are translations of medieval prayers; they are designed primarily for modern devotional use, but it's possible that the book will contain translations of prayers we discover. Does not include the Latin original, however. For identifying saints, especially saints in English (and to some degree French) contexts, your best option is a print book: David Farmer, The Oxford Dictionary of Saints, available in many editions. The UGA Library owns an ebook of this volume, so if you search the library catalogue for the title, it should pop up easily. Working with Books of Hours means working with saints and their attributes (the symbol that identifies who the saint is). One of the more thorough sites I've found is http://www.christianiconography.info/, although their samples tend toward the Renaissance rather than the medieval. However, most of the best resources are printed ones in the library; see the reserve list (if you're in a course with me) for recommendations. An oldie-but-a-goodie resource is Margaret Emma Tabor, The Saints in Art: With Their Attributes and Symbols Alphabetically Arranged (1908; available via Internet Archive). If you are looking at a particular saint or attribute, try searching for it on the British Library Medieval Manuscripts blog: http://britishlibrary.typepad.co.uk/digitisedmanuscripts/. They have a number of blog posts on individual saints in manuscripts, so hopefully they will have yours. The manuscript researcher and cataloguer Peter Kidd hosts an extensive website on the contents of Books of Hours (http://manuscripts.org.uk/chd.dk/tutor/index.html), including the most up-to-date (to my knowledge) method of determining the Use of (i.e., established regional variations in) a Book of Hours (http://manuscripts.org.uk/chd.dk/use/index.html). Another excellent resource for placing a Book of Hours (or another liturgical book) is to compare its feasts and saints to the data collected in Victor Leroquais, Les bréviaires manuscrits des bibliothèques publiques de France (6 volumes, in French, 1934). The Special Collections library owns a copy of this volume, but you can also consult it in a semi-searchable form at http://www-app.uni-regensburg.de/Fakultaeten/PKGG/Musikwissenschaft/Cantus/Leroquais/. This is not an easy resource to use, so (a) give yourself extra time to come to terms with it, and (b) if you're a student, come see me for a tutorial and tricks. On Internet Archive you can also find the printed corpus of medieval hymns, Analecta Hymnica Medii Aevi in 55 volumes. These are not translated, and you may have to hunt through several volumes to locate (for instance) your particular hymn for Mary Magdalene, but they are the authoritative bomb. Use alongside Chevalier, Repertorium hymnologicum. For identifying antiphons, chants, proses, hymns, and other liturgical elements (which are sometimes combined in idiosyncratic ways), use Chevalier, Repertorium hymnologicum (1981-1904 ) vols. 1, 2, and 3 (on Internet Archive). Alphabetized by first line of your antiphon/liturgical bit. In French, but still useable by anglophones. At the minimum, you can assign a Chevalier number to your liturgical bit (which may help you cross-reference it); if you're lucky, he will also provide useful bibliography and/or a "first attested" date. Use alongside CANTUS. The CANTUS database (http://cantusdatabase.org/) indexes and prints common and uncommon medieval chants and prayers. It is designed for professional musicologists and liturgists, but you may also find it helpful in identifyng texts in Books of Hours. Use alongside Chevalier and Analecta Hymnica. The Schoenberg Database of Manuscripts (https://sdbm.library.upenn.edu/) catalogues the physical descriptions of thousands of medieval manuscripts; it is an excellent resource for trying to put back together fragmented manuscripts or to search for auction records. Come see me for help with this resource. Also make use of the resources on my Paleography page, especially under "Advanced Resources"
Please note that this list is far from complete. Many other fully digitized manuscripts are available in major repositories (see below). Cotton, Pierre. Heures de Nostre Dame, a l'usage de Rome. Paris, 1619. Text in Latin; rubrics in French. Available on Google Books. The University of Pennsylvania Libraries has digitized many full and fragmentary Books of Hours. BiblioPhilly returns a wonderful 84 full and fragmentary Books of Hours. The Walters Library in Baltimore has digitized many of their manuscripts; the Digitized Walter Manuscripts website gives you a list of ALL their digitized manuscripts and you can browse for their Books of Hours. Not all manuscripts linked there have been fully digitized, however, and some digitizations are available only as PDF documents, not in browser viewers. The Houghton Library at Harvard University has digitized many of their medieval manuscripts, including Books of Hours (some fully, some partially). I am still coming to terms with their interface, but if you can locate the manuscript(s) you want in HOLLIS (their library catalogue), you can one-click to the facsimile in their Mirador viewer. This link should take you to a list of twelve viewable Books of Hours, but I believe that more should be available. The British Library Digitized Manuscripts repository contains (at least) 46 digitized Books of Hours. Cambridge University Library has fully digitized six Books of Hours and related prayerbooks. Here is a blog post by their digitization team on their Books of Hours. There are many, many more available through the major continental libraries - more soon!